Today was Old Trails Day on the road. Shortly after leaving Laramie at 7:15 this morning, I came upon a trio of landmarks. First, the Summit Rest Area on I-80 (at 8,640', this was the highest point on the Interstate as it had earlier been the highest point on the Lincoln Highway) featured a 13-1/2' bust of Lincoln atop a pedestal, looking down on traffic. A few miles further along, I turned down a mile-long dirt road to the Ames Monument, a 60' square, 60' high pyramid erected by the Union Pacific in 1882 to honor the memories of Oliver and Oakes Ames, two Massachusetts brothers who had helped bankroll the first transcontinental railroad. Originally this monument sat atop the highest point on the transcontinental railroad (8242'), but the tracks had long since been moved, leaving the monument alone, isolated, and virtually forgotten. Finally, a small rest area in the middle of the Interstate protected a pine tree growing out of a rock, which had survived in this precarious position for over a century. Union Pacific brakemen used to throw water on it as they passed. I turned off the Interstate at Cheyenne, for a quick swing past the state Capitol. Wyoming had been the first government anywhere in the world to grant women the right to vote; a statue in front of the Capitol honored the woman who kept the suffrage provision in the proposed state constitution even though a number of Congressmen objected. In the 1920s Wyoming was also the first state to be governed by a woman, Nellie Tayloe Ross. At the Nebraska border, US 30 veered north of the Interstate, where it would remain the entire way across the state. The first spot of interest was the Generic Motel in Sidney: it used to be called the Round-Up, according to the highway sign, but the owner's apparently a realist with a sense of humor. In this part of the state, traffic is so infrequent that three out of four passing drivers waved as they went by. At Ogallala, US 30 met up with the Platte, and the pattern for the entire state was set. The Platte had been a major east-west route for 150 years: the Oregon, California, and Mormon Trails, and the Pony Express, all passed through here. (For the rest of the day the road was marked by Mormon Trail signs.) 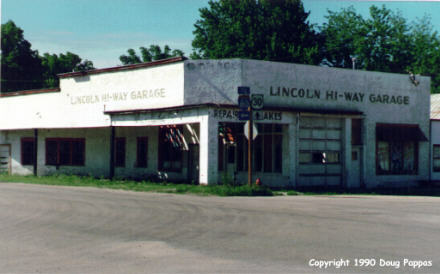 So did the original transcontinental railroad, the Lincoln Highway/US 30, and, a few miles south, the Interstate. Though the details varied a bit, as did the size of the communities, the rest of the day's trip followed a similar course. There was a town every ten or so miles, its spindly water-tower painted with the town name and standing guard. The water tower was dwarfed, though, by the grain elevator adjoining the railroad tracks which bisected the town. Sometimes, where the elevator and railroad blocked the path of the short road to the Interstate, an overpass ramp was erected a couple of blocks away. One side of the tracks contained the nicer residences; the other, commercial and industrial sites. Every town had at least one faded motel or tourist home, often long-abandoned and boarded up. With land so cheap, no one bothered to tear down failed businesses; in fact, some downtowns seemed to contain more closed businesses than open properties. Even a town of 500 people would have its own grain elevator and related businesses, service station, and post office: a tiny, self-contained community. Might be fun to spend a couple of weeks in one of these places, seeing how it works and how the people interact -- but from everything I've heard, would not be fun to grow up in such a town. The people didn't vary much from town to town. Confirming the hypothesis I had formed at the 1986 Oklahoma State Fair and refined during the 1988 drive through North Platte, I noted that most of the young women from the prairies were much cuter than average, but that almost every woman over 30 or so was dumpy and unattractive. Maybe it's some sort of natural phenomenon: look good to marry young, then let yourself go. By contrast, from all appearances, the men stop worrying about their looks as soon as they're old enough to drive -- a good car must count for more than a good face. At about 3:00, I got to the first real stop in Nebraska, Scout's Rest Ranch, home to Buffalo Bill Cody for 25 years. 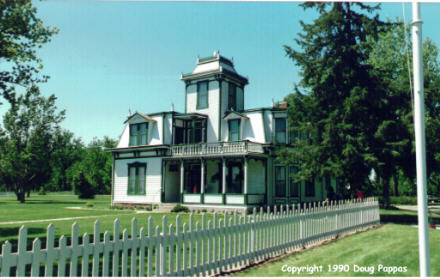 Nice Victorian home, well furnished; huge barn, capable of holding dozens or hundreds of animals; and originally 4,000 acres of land. Saw the "official" 15-minute film biography of Cody, including rare footage of the Wild West Shows (which ran from about 1882-1912) -- not bad, though the scriptwriter was obviously taking care to show the respect Cody had for the Indians. Next stop: the Pony Express station in a city park in Gothenburg. The station had actually been moved some miles from its original location (as pointed out in small print on an explanatory sign), but wound up in a very photogenic location. [I later learned that this probably wasn't a Pony Express station at all. Gothenburg's also the town where Tot Holmes has established a Brooklyn Dodger Hall of Fame in his house -- but I forgot to check the SABR directory before leaving home to track him down. Oh well; I got through Gothenburg at about 5:45, with over 200 more miles to go that day. West of Kearney, the old 1733 Ranch -- 1733 miles to both Boston and San Francisco -- had been replaced by a typical suburban development of ranch houses. The most significant difference was that the streets and driveways were gravel, not paved; I can't even imagine someone creating such a development back east. A few feet west of the old ranch, the Covered Wagon Souvenir stand still beckoned tourists with its huge cement wagon-and-horse-team out front; I photographed it, but didn't go inside despite the "Open" sign. Looked like it was part of someone's house and I might be interrupting their dinner...oops, in this part of the country it would've been their supper. Besides, I was late enough. Kearney also marked my return to the East in another sense -- the first Civil War monument I'd seen on the way home.